When designing homes, businesses, schools or medical facilities, security is an important factor. While today’s market of locks features great variety and many different functions, the following provides a description of the six most common door locks. A storeroom lock is used to keep electrical rooms, storage rooms and mechanical rooms private and secure. This system uses an outside lever remains locked all the time. The door can be opened by using an outside key or inside knob lever to retract the latch bolt. It is important to know that there is no way to unlock or lock the door from the inside. A storeroom lock is intended for use in rooms that do not use panic hardware, and a door closer can be helpful to have to make sure the door is never left open. A privacy set is used in company restrooms and dressing rooms. It is also a good option for bedrooms and bathrooms in residences. 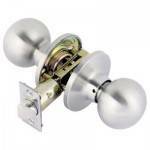 This lock is secured from the inside using a push/button turn or thumbturn. Instead of being unlocked with a key, this set requires the use of a special tool. This set can also be used in hospitals when modified with a thumbturn on the outside and inside of the handle. This allows medical staff full entry. Some privacy sets may also include an indicator that shows if the door is locked or unlocked. An office lock is a good choice for locations that do not require locked security at all times. Such locations may include a storage closet or individual office. An office lock does require a key to open the door from the outside cylinder as well as a push button/turn or thumbturn on the inside of the door. The lever on the outside can be placed in the locked or unlocked position at all times. However, this does allow a person without permission to enter. A classroom security lock is used in schools around the country. In fact, some school districts require this lock in order to keep a classroom secure at all times, even during a lockdown or intruder incident. The lock is controlled with a key cylinder on the outside and inside of the door. This is important when teachers must lock their classroom door during an emergency, as it does not require the door to be opened. When used school wide, each classroom door can be locked and unlocked by the same key. This is called maison keying. A classroom lock can be used in schools and office buildings. However, many schools now use the classroom room security lock mentioned above. The classroom lock utilizes a key in the outside cylinder, which then unlocks or locks the outside lever. The key can leave the lock in the unlocked or locked position, but the door cannot be secured or unsecured from the inside. This lock was first designed to stop students from locking doors from the inside of their classrooms. Today it is a good option for doors that do not need to secure a room with a pushbutton/turn or thumbturn. />This is used when a door does not require security through a lock. This set does not have a key cylinder and the inside lever is always free. What Brands of Locks are Best? If you are interested in learning more about these locks, contact us here at Great Valley Lockshop by calling us at (610) 644-5334 or by filling out our online contact form. You may also want to check out our Frequently Asked Questions page for some answers to common questions our customers have when it comes to locks for their business or home. If you already know the locks would like to purchase and install, feel free to fill out our free online estimate form so that we can give you an accurate price for your project. Our services provide homes and businesses located in Pennsylvania, Delaware, Maryland, and New Jersey with expert security!